If you receive Social Security benefits, Social Security provides you with an annual Benefit Statement, also known as the SSA-1099 or the SSA-1042S. 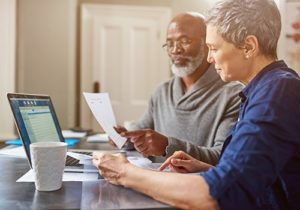 A Benefit Statement shows the total amount of benefits you received from Social Security in the previous year, so you know how much Social Security income to report to the IRS on your tax return. If you misplaced your Benefit Statement or didn’t receive it by the end of January, and you currently live in the United States, you can get a replacement form quickly and easily with a my Social Security account. Do you own a business or help other people with their taxes? Our Business Services Online suite of services can help individuals and small businesses prepare for tax day. There, you can report employee wages and verify names and Social Security numbers for W-2s. It’s a free, convenient, and secure way to do business with us. You can also check out our Information for Tax Preparers site to find out all the ways we can help you prepare for tax day this year and in the future. A my Social Security account helps you out several ways during tax season and beyond. In addition to getting your replacement Benefit Statement, you can check your Social Security Statement to verify your annual earnings are posted correctly. Errors in your earnings record could affect the amount of benefits you receive in the future. By verifying that your earnings were reported correctly, you are helping us keep your earnings record accurate. Sign in or create an account, and see what you all can do online with my Social Security. Social Security is with you on Tax Day and throughout life’s journey. Visit us online today! This entry was posted in Taxes and tagged april 17, benefit statement, Business Services Online, federal taxes, IRS, My Social Security, my social security account, report wages, SSA-1042S, SSA-1099, tax day, tax return, tax seaason by Jim Borland, Acting Deputy Commissioner for Communications. Bookmark the permalink. Why are Social Security benefits considered as Taxable Income??? Incomes while working were already taxed!!! Why should people have to pay state taxes when they are already low income bracket receiving Social Security? Rediculous! The Soc Sec taxes you paid while you were working supported the Soc Sec benefits of those people who were already retired. Your taxes are NOT a form of savings account for your own Soc Sec benefits. Now that you are retired the Soc Sec taxes of those people who are presently working are allocated to pay your benefits. The working generation has always provided the benefits for the retired generation; it has always been a pay forward system. In the past there was a higher ratio of workers to retirees than there is now, and that was a good thing. That ratio has fallen sharply and the situation puts more strain on the pay forward system and causes many young people to think the system will be bankrupt before they retire. You can thank Al Gore for making up to 85% of your benefits taxable, before his vote that number was 50%. Do I have to file my social security benefits? What is the income amount now where a person does not file, in a year. ? I get RSDI every month and I work part time. I have W2’s can I file for taxes? If I file for taxes and receive a return will that stop me from getting my benefits if my return is more than $1170 a month? If you don’t file you can not get a refund can you? Refunds do not affect Title II retirement benefits. No, Kevin. your tax return will not affect your retirement benefits. Do a individual who have a annual income for less 12,000 a year that receive a 1099 have to file for Tax Return? Depends upon age, marriage or if filing separately over filing a joint return. Since this is an IRS question, why don’t you ask them? Hello Douglas, see “Income Taxes And Your Social Security Benefit” for information on this topic. Contact the County Public Assistance Office. Is the SS-Retirement benefit amount the same as SS-Disability? If not, which benefit is better for me? Disability payments are established at the highest rate possible, Michael. When you receive disability benefits under the Social Security Disability Insurance (SSDI) program, we will automatically convert your disability benefits to retirement benefits, when you attain your Full Retirement Age. The benefit amount will generally remain the same. Thanks! Hi Charlene, for information on Income Taxes And Your Social Security Benefit visit our Benefits Planner. For tax questions, you will need to contact the IRS. Their toll-free number is 1-800-829-1040. Thanks! phone, and #, I am still having problems with accounts!! Safeguarding your identity and Social Security is of the utmost importance. If you think you’re a victim of identity theft, please act now. For more information, read our publication Identity Theft And Your Social Security Number. Thank you, Neena! We’re pleased we can help. We will continue our efforts to meet your requirements and expectations in the years to come. I wish to know if I do my tax now I got 1050 benefit let me know if I got to do it thanks. Hello Carlos, please visit our Benefits Planner: Income Taxes And Your Social Security Benefits for information on this topic. Thanks! After tax cuts by president,how come my as check doesn’t show a slight increase,as I have taxes taken out of my check? Hi Kathy, for income tax question, you will need to contact the Internal Revenue Service (IRS). Their toll-free number is 1-800-829-1040. As a Advisor I really appreciate the SS Administration and the great work their staff does. Probably the best program where you can always find out what you will get at retirement. Thanks for your feedback, Amit! We value your opinion of us and look forward to many more years of serving you in the future. I was told no need to file is this true ? We’re sorry that you’re having difficulties, Melissa. I need help with my taxes,I get government benefits from o.p.K,aretired. Hi Shirley, for tax questions, you will need to contact the IRS. Their toll-free number is 1-800-829-1040. Thanks! I have not filed my 2017 Income Tax forms as of yet because my new wife is overseas in Morocco and I do have her W-7 Form for her ITN request. Will I be able to file as married filing jointly? Thank You. For income tax questions, you will need to contact the IRS. Their toll-free number is 1-800-829-1040. Filing jointly and only have SS. Did Turbo Tax and wasn’t going to file then received 1099-Rs from a previous employer, one for $138.72 with &27.74 tax withheld and one for $6.42 with no tax withheld. Do I need to file this or not? Hi Marian, for tax questions, you will need to contact the IRS. Their toll-free number is 1-800-829-1040. Thanks! My # is *** – ** – ***. I would like to have my back taxes taken out of my check by 100$ a month, I am already paying 50$ a month plus 686$ for this years taxes which makes 2084$ taxes. Please let me know that whether I can do this. I will have to call IRS to arrange this payment or would you, I have a already made the previous years arrangements now I have to make this years added to what I already owe. Thank you. Hi Erma, see Withholding Income Tax From Your Social Security Benefits for information on this topic. You Guys do a great job!!!!!!! Especially for us OLD GUYS!! Does this mean that Social Security Recipients need to file taxes now? Hello Constance. Some people have to pay federal income taxes on their Social Security benefits. This usually happens only if you have other substantial income (such as wages, self-employment, interest, dividends and other taxable income that must be reported on your tax return) in addition to your benefits. See our Benefit Planner: Income Taxes And Your Social Security Benefit for more information. Thanks! I receive SS Disability. My 2 sons receive a small portion of my disability amount. Their father is in prison. I have yet to get a divorce. I am their only source of support and they live with me. Can I file federal taxes and receive EITC? I have a Situation regarding an overpayment. I’ve been trying to get in contact with the supervisor basically for the last year to kind of settle this huge overpayment that initially was $176,000 owed to you. I am not really getting anywhere I really need help with somebody internally there at Social Security can someone call me ASAP 702-523-2342 so we can get this taken care of just been going on for 10 years eight different overpayment. We wish we could be more help Tracy, but for security reasons we do not have access to personal records in this blog. Your local office is better prepared to assist you in resolving this overpayment issue. For more information and to learn about appeals and waiver rights, read our publication on “Overpayments“. If you still have questions, or need further assistance, you should call our toll-free number at 1-800-772-1213. Representatives are available Monday through Friday, between 7 a.m. and 7 p.m. Thanks! I need to have federal income taxes taken out of my ss check. How do I go about doing that. Please respond to denisemah@verizon.net. Hi Denise. We do not have access to personal information, therefore, we do not do direct messaging in this venue. Please visit our Benefits Planner: Withholding Income Tax From Your Social Security Benefits web page for information on this topic. How do you have taxes taken out of your social security check? My husband William Theodore Glass passed away last December 4, 2017. I never received his tax form to file with our taxes for 2017. I tried to set him up an account so I could just print a new one but it wouldn’t let me set him up an account. Is there anyway I can have a code sent to me so I can open up an account & can print out one and not have to come into the social security office. We are sorry for your loss, Leola. You can only create a my Social Security account using your own personal information and for your own exclusive use. For further assistance or to make an appointment, call our toll free number at 1-800-772-1213. Representatives are available Monday through Friday, between 7 a.m. and 7 p.m. Thanks. I worked in 2016 and retired on Dec 31, 2016. Some of my pay was received in 2017. Is that money I received consider work in 2017 and used to reduce the amount of social security that I receive in 2017? not affect your Social Security benefit if they are for work done before you retired. See “How do special payments I got after I retired affect my Social Security retirement benefits?” for more information. Thanks! I have a saved app. pending to file for benefits. Before I file I want to know if I can deduct 20% / mo, of the monthly benefits toward IRS TAXES? Hi Matt, thank you for your question. There is not an option to sign up for voluntary tax withholding in the application path. You can download the form or call the IRS toll-free at 1-800-829-3676 and ask for Form W-4V. When you complete the form, you can choose to have 7, 10, 12, or 22 percent of your monthly benefit withheld for taxes. See our Benefits Planner: Withholding Income Tax From Your Social Security Benefits for more information. I am receiving SSA retirement benefits for about 6 yrs. I wanted to arrange to have taxes taken out (Federal, State and NYC). Do I need to visit an SSA office or can forms be mailed to me? May I have extra taxes paid in advance to cover my Pension as well? SSA $2200 and Pension $1600 = $3800 monthly. Thank you. I may be owed some money by the government the total is $837.00. when can I receive these funds? My phone number is 419 515-4109. My email is rosetaylor1013@yahoo.com. Thank you for contacting us, Rose. Unfortunately, and because of security reasons, we do not have access to personal records in this blog and cannot assist you. To inquire about an underpayment, you will need to contact your local office or call our toll-free number at 1-800-772-1213. Representatives are available Monday through Friday, between 7 a.m. and 7 p.m.
How can I request a tax deduction for 2019 ? Can I fill one online? I retired from work In May of 2018, and applied for Social Security when I reached 66 in June 2018. Now, because of the information I read on the SSA site, I wonder if the income I made the first part of 2018; might actually cause me to lose some of the Social Security benefits I collected the second half of 2018 after I had 1) official reached full retirement age and 2) stopped working? Hi, David. If you work and are full retirement age or older, you may keep all of your benefits, no matter how much you earn, starting with the month you reach your full retirement age. For more information, check out our publication, How Work Affects Benefits. If you have more specific questions, you can call us toll-free at 1-800-772-1213. Representatives are available Monday through Friday, between 7:00 a.m. and 7:00 p.m. You can also contact your local Social Security office. Thanks. I would like to have $200 withheld each month for my social security check. I haven’t found where to do this. I tried calling my local office but couldn’t get through to talk to anyone. Hi, Jennifer. For your security, we do not have access to private information in this venue. Good news! You can click “Get Help” in your personal my Social Security account to “Ask a Question”. You can click “Talk to an Expert” for a call back. We hope this helps. I tried to create an account. I requested my security code by e-mail. The e-mail you sent did NOT have security code a with it. If you rejected my account application it is because you asked me for information too old to recall such as phone numbers I had 2003. I did not receive my SSA 1099..Get it t me ASAP! Hi Paul: We are sorry that you are having trouble creating a my Social Security account. To pass the verification process, we match the personal information you give us with the data we have in our records. Then, we use our Identity Services Provider to further verify your identity. If you are locked out, you can call us at 1-800-772-1213 (TTY 1-800-325-0778), Monday through Friday from 7 a.m. to 7 p.m. At the voice prompt, say “helpdesk”. When you call, you can also request a replacement SSA-1099. I DON’T do a thing! Hi, Lisa. For your security, we do not have access to private information in this venue. You can request a replacement SSA-1099/1042S for Tax Year 2018 by visiting your personal my Social Security account. You can also contact or visit your local office. They can assist with a replacement 1099. Just a reminder – please be cautious about posting personal information on social media. We hope this helps. Need a replacement SS form to file my taxes. The social security form sent in Feb for total earnings in 2018. Good news, Wilma! You can request a replacement SSA-1099/1042S for Tax Year 2018 by visiting your personal my Social Security account. Thanks! My mother needs a replacement 1099. She is 89 and not computer literate. I am prohibited from setting up an account for her. How do we get her a 1099? I came to the SSI site to look for advice on the best simple and affordable tax prep software for a person who only receives SSI income and hasn’t much else to declare, except perhaps donations and medical expenses. Simple, senior citizen user friendly, free or budget friendly. Please add some recommendations and advice on this request. Hi, Kathleen. For any income tax questions, you will need to contact the Internal Revenue Service (IRS). Their toll-free number is 1-800-829-1040. We hope this helps. How do I get you to mail another 1099 to a friend who can’t find hers? Hi, George. Your friend can request a replacement SSA-1099/1042S for Tax Year 2018 by visiting her personal my Social Security account. We hope this helps. They didn’t collect taxes on S.S. until Reagan. Then Clinton raised the taxes higher.